SCRATCHES, SCRATCHES, SCRATCHES….it crashed the floor in Your lovely home. And moreover - Your bed is sliding from the wall to the wall and sofa is in a different place always! How much nervous do You spend every time when it happens? JUST STOP IT NOW WITH NON SLIP FURNITURE PADS X-PROTECTOR! 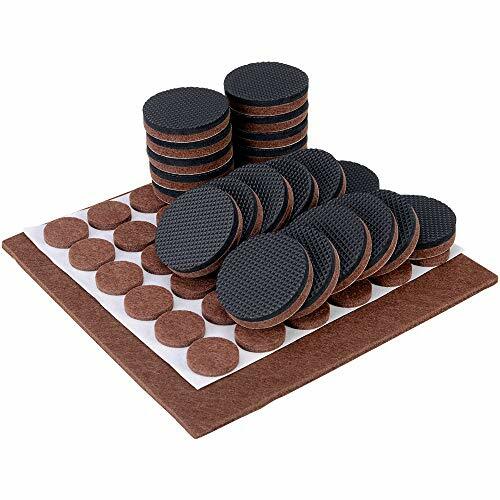 MAIN ADVANTAGES OF NON SLIP PADS X- PROTECTOR : HIGH QUALITY – our anti skid pads - hardwood floor protectors are made by new DOUBLE TECHNOLOGY - solid felt 1/5” and soft thick rubber pad make soft and strong fixing of any furniture on the floor surface. TENACIOUS ADHESIVE - FORGET ABOUT COME OFF FURNITURE COASTERS! Our floor pads - rubber floor protector X-PROTECTOR have strongest adhesive which does not allow to come off from furniture feet and it doesn’t matter is it heavy item or not. STRONG AND SOFT PROTECTION FOR YOUR LOVELY FLOOR – our furniture pad rubber feet - X-PROTECTOR have new strong and damping construction and they provide the best careful protection for all types of Your lovely floor - Hardwood, Laminate, Tile, Vinyl, etc. Best anti skid furniture pads! PREMIUM GREAT PACK 36 FURNITURE GRIPS – 16 pcs 2 inch + 12 pcs 3 inch + 8 pcs 4 inch – ENOUGH ANTI SLIP RUBBER PADS SELF STICK FOR ALL YOUR FURNITURE! Our floor protectors for stay in place furniture will keep in place all items and protect Your floors. Get Your new couch coasters – couch leg grips - anti slip furniture pads! IF YOU DON’T LIKE CONSTANTLY TO HAVE DEAL WITH SLIDING AND SCRATCHING YOUR LOVELY FLOOR FURNITURE, PRESS THE BUTTON «ADD TO CART» RIGHT NOW! If you have any questions about this product by Coolwoo, contact us by completing and submitting the form below. If you are looking for a specif part number, please include it with your message.